In the year 2012, solar PV industry has undergone severe losses, many companies are in the State of closure. There was so much over supply, the market has pushed into severe losses. But by mid 2013, there are clear signals of industry recovery. Market researcher NPD Solarbuzz has reported huge demand in China and Japan. NPD Solarbuzz forecasts solar photovoltaic (PV) demand from China and Japan during 2H’13 to reach 9 GW, representing an increase of 100% compared to 1H’13 and 70% compared to 2H’12. 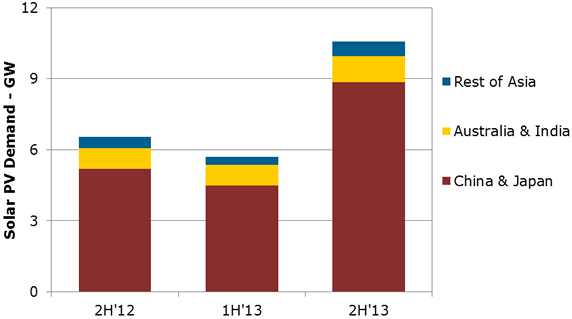 Overall, PV demand from the Asia Pacific (APAC) region will exceed 16 GW during 2013, up 90% Y/Y, and will account for over 40% of global PV demand this year, as per NPD Solarbuzz. While China and Japan are currently fuelling project pipelines, demand from the APAC region remains highly dependent on Chinese and Japanese FITs. In Japan, the market is also showing signs of strain: module shortages have been reported, and developers are being forced into remote geographic areas.